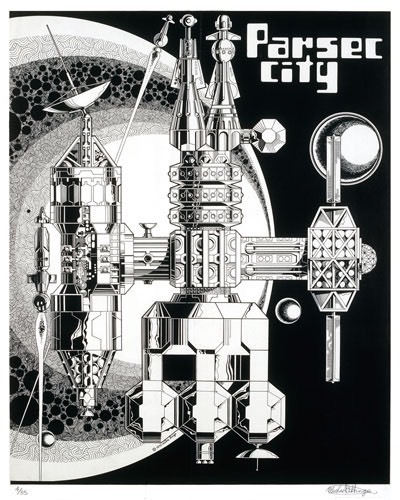 Our late friend Mike Hinge was taken by Science Fiction, his major subject in art. We'll post more of his works here as we find them. The email (edited) below was sent to Ivan Richards (who's done a very nice blog on Mike) when I discovered the blog and began telling him about my friendship with Mike. 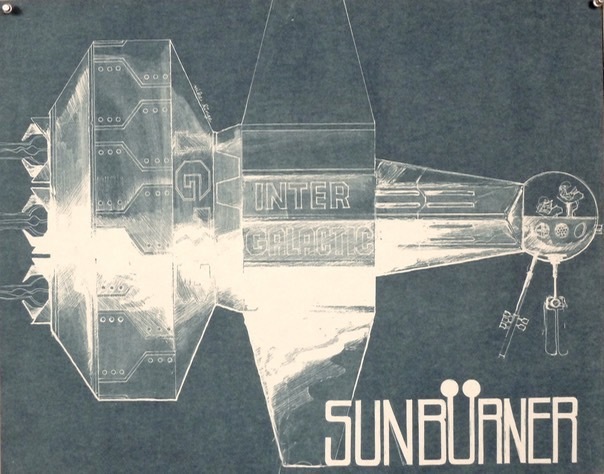 I Googled Mike Hinge last weekend and discovered your blog. It's terrific. I'm the Ron Williams referred to in the material about Mike and his involvement with the "ONYX" group. I can tell a bit about Mike and my friendship with him during the late 70s and early 80s. It was pretty intense as I'm sure anyone's encounter of Mike would be. If I remember correctly, we met while we both worked for Donald Deskey Associates, the design firm. My background was in architecture and his, you know. ONYX was the getting together of Woody (J. Woodson) Rainey, Tommy Simpson, Mike and myself. There were many descriptions of what ONYX meant but largely it was an attempt to bring different sensibilities together and to resist the temptation to declare a manifesto. We published broadsheet/posters that we distributed to friends and colleagues and plastered on the walls of Manhattan's back streets. The name came from the definition of onyx as a many layered stone. Woody Rainey has taught and practiced architecture in Manhattan since the late sixties. Tommy Simpson has made his way as an artist since I can remember, showing and selling his work all over the North East. 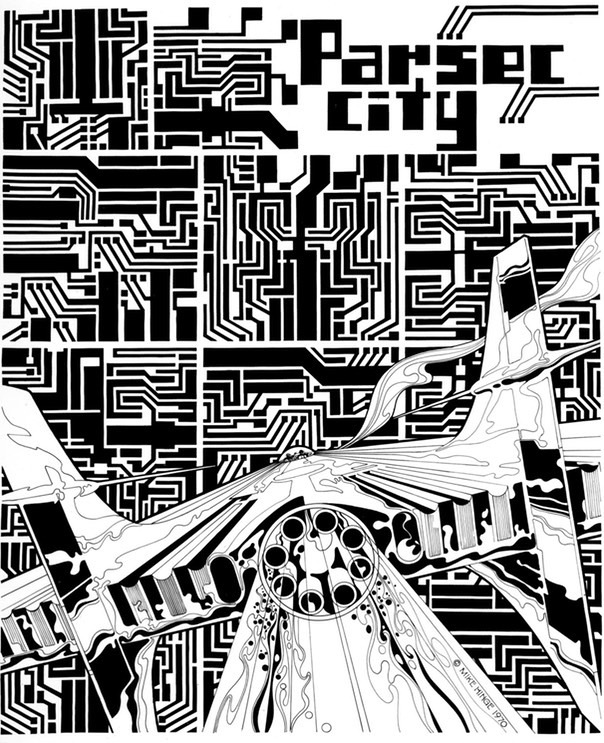 Mike exhibited with us showing his art work and published a poster, the Parsec City. Tommy came into contact with us but I can’t remember if he did any specific work that he considered an ONYX project. Woody did a mandala like calendar for an eight day week and other sheets displaying abstract architectural ideas. My work illustrated architectural projects involving fantasy designs exploring extreme spaces. When I first met Mike he was living in a 1950s apartment building on West 16th Street just off 5thAvenue. He had a large studio apartment crammed with his work and ongoing projects. He was just beginning to explore electronic light sculptures and designing his type faces. The apartment was piled at least waist high with boxes and portfolios and with narrow passages between the collection to get to the facilities, the kitchen and his work area. 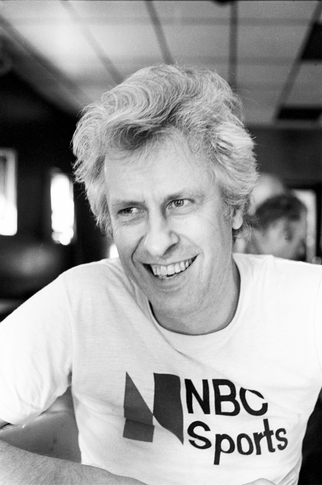 One of Mike’s main preoccupations was with the state of his collected works and collections stored in Los Angeles. He had trunks and boxes stored in a warehouse there and was defaulting on his rent, in danger of losing it all. I’m not sure what happened to it but the experience would be repeated again and again. I would lose contact with him now and then and in the interim his life would seem to go through many changes though he kept working. He moved to a loft on West 26th Street in Manhattan’s Flower district. The loft was high ceilinged and perhaps 30 by 80 feet. In a matter of months he had filled it with the voluminous material he managed to collect. He was a nightly dumpster diver and found a container where a nearby a liquor store threw their empty boxes. He tried many different “brands” of boxes before he decided that J&B scotch whiskey boxes best served his needs. He labeled and stacked them, filled with material he figured would be useful or that he couldn’t resist. He collected giant glass jars that once held pickles and even larger brown plastic olive jars from delicatessens and restaurants. These too were carefully labeled to describe their contents - the variety of those contents was mind boggling. Often, when wandering around Manhattan with him I would discover that I was “talking to no one” as Mike would disappear when he would see a promising piece of paper on the sidewalk or in the gutter and scoot away to retrieve it. He had receipts, ticket stubs, cigar bands, cigarette packages, every kind of small paper souvenir of someone’s encounter with the city. A lot of the J&B boxes were filled with beer cans from all over the world, brands I’d wonder how he’d found in New York. The glass jars were filled with match books. Unless he had an appointment with someone and a schedule to meet it could take forever for him to get from one place to another. He could not resist stopping into random bars and restaurants to ask for a business card and a book of matches. I never saw him drink but he sure had a lot of beers (an unopened full can was prized above all). The last time I saw his loft, he had the same environment as on 16th street but times 4 or 5. The stacks of green J & B boxes reached nearly to the ceiling and the aisles between the collections made the place seem more a library or very special warehouse than a studio. We would wander into an out of each other’s lives periodically. I would bump into him and hear that he had lost his last place and that he was living in the studio of someone he was working for. Then he’d have a new place. I drove Mike down to Reading, Pa once to visit a bunch of his comic/SF pals. He introduced me to Steranko; his followers had discovered the low rent residential area that beat out anything for hundreds of miles. Mike was always on the verge of poverty, living a life of feast or famine during the years we hung out. I think Pennsylvania became a back-up for him as an inexpensive place to live after he saw how the Steranko crew had adapted. Mike was quite secretive in many ways. I was surprised to learn of his age on Ivan's blog because that was a taboo subject when my friends and I knew him. New Zealand was as much as he would say about his past and nothing about the place at that. When he agonized over the loss of his collections in L. A. he would reveal as little as possible. Knowing how reluctant he was about his history, we wouldn't press him but we'd tease him about his unknown age. Mike rolled his own cigarettes. When someone mentioned that there were those that could roll two at a time he immediately gave an outstanding demonstration of the art. His taste in music was universal except for one thing about which he was vehement: he could not stand voice. To him to sing was all but sinful and he would not hesitate to express his displeasure with the singer’s art. Opera was the last straw. My friendship with Mike went dormant during the mid 80s as we both found new pursuits to engage. I had written and illustrated a book that was inspired by a short trip Mike, my daughter and I took in 1976 when we visited an international model airplane meet at Lakehurst, New Jersey. Like many of the encounters and friendships one makes in Manhattan, we went our separate ways. The friends we had in common had all moved out of the city. I discovered that he’d died a few months after his passing and could not find much about him on the web. I often wondered what happened to the things he collected – they were attractive to him not as individual objects but as they represented areas of work, design and as a cumulative expression of life. If I had the money at the times his collections were threatened, and the sense to know how important they might be, I would have done more to help him keep them going. Too soon old, too late smart. Ivan, your dedication to his memory is marvelous and he really deserves it. He was a truly unique human being and I for one have been made all the richer for having known him.